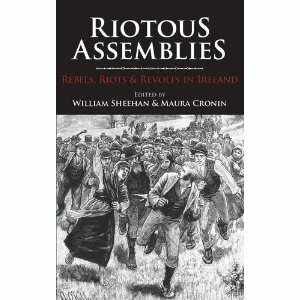 Riotous Assemblies – Rebels, Riots and Revolts in Ireland, Edited by William Sheehan & Maura Cronin, Mercier 2011. There is much that is good in this book, but it is not a history of riots or rioting in Ireland. Rather it is a collection of various historians’ work on a very broad range of topics – from the townsmen of 16th century Ireland refusing to pay “cess” or military tax, to passive resistance to the tillage quota imposed by farmers during The Emergency – pieced together from a conference that was held in 2009. While there is nothing wrong with this from the point of view of conference, a book should surely try to draw together the strands of its topic in a more cohesive way. If this volume was intended to be an account of important riots in Irish history, it misses a lot out. There is much to like in this book but it is not a definitive history of the riot in Ireland. The urban rioting at the start of the 1641 rebellion is absent for instance, as are the militia riots of the 1790s, which helped to send the United Irishmen on the road to insurrection, Dolly’s Brae and other deadly affrays between Orangemen and Catholic groups in the early 19th century are not here. Nor are Belfast Home Rule riots of 1886, the class strife in Dublin in the 1913 Lockout doesn’t get a mention, nor do the clashes between the Blueshirts and the IRA in the 1930s, nor the Parades controversies in Northern Ireland of the 1980s and 1990s. This would be all right if the book had, instead, a central theme – if, say, it defined what was meant by a ‘riot’ and used various, otherwise unconnected episodes to illustrate how and why a riot happens. But Riotous Assemblies does not do this either. In fact, two of the contributions, on Irish smallholders’ travails during the Second World War and on the Fianna Fail grassroots’ reaction to the IRA Border Campaign of the 1950s, openly admit that they have nothing to do with rioting at all. The chapters concerned are not without interest, but they have little to do with the book’s purpose. As a result, this reviewer was left a little irritated by the book’s unconnectedness. More effort, one feels, might have gone into shaping it into a coherent whole. The Riot – street battle or street theatre? The riot is indeed a fascinating phenomenon. It may be defined as the use of collective violence by many people in a public place, but beyond that it encompasses a very wide range of behaviour, sometimes very violent, sometimes not. A riot is not the same as a battle – lethal conflict between armed adversaries, where the aim is to kill, incapacitate and otherwise destroy the opposing force. The riot is characterised by a much lower level of violence and usually non-lethal weapons – fists, sticks, stones and more recently petrol bombs. Though this may happen simply because the protagonists have not armed themselves yet with lethal weapons. Many riots in Northern Ireland in the 1970s ended up in gun battles, for instance. Some riots end in massacres, others are not bloody at all. Why is this? Some riots are extremely bloody. The Tithe War of the 1830s – covered here in an interesting chapter by Noreen Higgins-McHugh – was something of a bloodbath, with repeated massacres of Catholic crowds resisting the payment of tithes to the Church of Ireland by troops and police and one retaliatory massacre of 14 policemen in Kilkenny. The Belfast riots of the 19th and early 20th century, involving hostile crowds of Catholics and Protestants, were also famously lethal and destructive of property. Other riots are not bloody at all. Sometimes the point is to publicy demonstrate discontent or to use minimal violence –a kind of moral force – to for instance occupy a contested public space or to halt an unpopular state action. Most rioting around strikes or evictions falls into this category. In certain situations, both sides, be they rival crowds or civilians and state forces, tacitly acknowledge limitations on violence. Sometimes it is expected that only fists be used, at other times stones and petrol bombs and in return, batons and rubber bullets, but not actual bullets. Why do riots sometimes abide by unwritten rules of conduct limiting violence and at other times degenerate into massacres? It would have been interesting to see this book tackle questions like this. However, there is, as noted at the start of this review, much to like in this work. One of its strengths is the discussion by several authors of the element of public display and street theatre about a riot. Clodagh Tait notes that in Tudor times, a riot would invariably take place in locations like the town bullring or elsewhere where the townspeople as whole could see them. Stephen Carroll looks at rioting in Dublin in the 1613 election, when Protestants became a majority in the Irish Parliament. In 1629 and again in 1662 in Dublin, Mark Empey shows how the Protestant “New English” interest, with the assistance of troops, assaulted a Franciscan Catholic Church on Cooke Street, in an effort to publicly demonstrate Protestant supremacy in the city. In a fascinating chapter on rioting in 19th century Limerick, John McGrath looks at, among other things, repeated instances of rioting between rival nationalists, especially between the Fenians and clerically-backed constitutional nationalists, over who would lead nationalist parades in the city. The symbolic value of the riot, for control over public display, could hardly be better demonstrated. Another interesting point raised by McGrath is the question of ‘recreational rioting’ – noting that rioting before the era of organised sport and even afterwards, could be a kind of team game for bored young men. There were other very interesting contributions. John Cunningham gives much food for thought in his account of how the Irish-speaking community of Lettermullen in Connemara became involved in a stand-off with the police and the coastguard in 1873, over the salvage of a shipwreck. The police started off by allowing the locals, under the 1854 Salvage Act, to keep some of the salvaged goods in return for help recovering the wreck, only to change their minds halfway through and forbid them to take any washed up timber – in the end shooting 300 rounds of ammunition at the islanders who were collecting it and killing two. Two points arise here. The first, being whether it is really possible to speak of ‘rule of law’ in 19th century Ireland when the authorities could simply change it when they felt it expedient. The second concerns the nature of the Irish “imagined community” at this juncture. For the police were English-speaking Irishmen and seem – in these pre-Gaelic revival days – to have regarded the Gaeltacht people not as, ‘pure Gaels’, but as “ignorant” and savage”. Liam Kelly, in a chapter on the Belfast riots of August 1969, points out that the violence of that month, often cited as the harbringer of the Troubles and the birth of the Provisional IRA, was actually confined to a fairly limited geographical area in the city –where the Falls borders the Shankill and in Ardoyne in north Belfast. Elsewhere, even ‘interface’ areas such as the Short Strand remained calm – a useful reminder that the ‘de-escalation’ of conflict by people on the ground at various times made The Troubles much less bloody than they might have been. The closer we get to the present, the more history overlaps with personal experience and this reviewer’s experience led him to take issue with the final chapter – that by Ealair Ni Dhorchaigh and Laurence Cox on the modern policing of protest in the Republic. The theme is why in 2001-2004 garda policing of anti- (or here ‘alter’)-globalisation movements became so confrontational. The authors posit that it was because of neo-liberal globalization – “which rejects on principle the kind of investments and concessions needed to win popular consensus…This thus marks a shift from consent to coercion”. Did the policing of anti-capitalist protests in 2001-2004 mark a new authoritarianism in Ireland? There are a number of things wrong with this analysis. The first is that it takes no account of the actual history of either state power or of capitalism in independent Ireland. Ireland never developed an extensive welfare state until very late in the 20th century and far from it being attacked during the Celtic Tiger era, it was greatly expanded, albeit largely in return for electoral support. So “concessions and investments” were very much on the table in this period. (An interesting discussion here on the lazy uses of terms like ‘neo-liberal’ in an Irish context). Secondly, did the rather heavy handed policing of the anti-capitalist movement in these years – beating up a Reclaim the Streets protest in 2002 for example – constitute unprecedented authoritarianism? Hardly. Let’s leave aside as exceptional the draconian laws deployed against republican paramilitaries since 1922. In another chapter of this book for example, Bryce Evans shows how the Fianna Fail government during the Emergency was prepared to confiscate small farmers’ land if they failed to meet tillage quotas. In 1986 the Irish Army was used to physically disperse a strike by Dublin Corporation workers. Use of coercion against protest is nothing new in Ireland. Thirdly, members of the small student-based anti-capitalist left returned from Genoa in 2001 under the illusion that the world revolution was around the corner and accordingly tried to provoke confrontations with the gardai – a factor which largely explains, though does not justify, the police response. In the years since then some of the members of the anti-globalisation movement seem to have embarked on a much-more-productive strategy of community and electoral activism. In any case, is this really the most significant example of the riot in Ireland in recent years? The anti-globalisation protests drew little response from the general public. In contrast, more traditional fields of symbolic battle, such as the confrontation outside the British Embassy in Dublin during the Hunger Strikes of 1981 or 2006 ‘Love Ulster’ riot, involved thousands of people and very violent confrontations. Not to mention Northern Ireland’s highly elaborate culture of rioting since the late 1960s. A look at why nationalist mobilization continues to be the most contested and potentially explosive kind of public confrontation – including from the poor and marginalized – might have been worthwhile. To sum up, while this book contains much of interest on popular protest and public confrontation in Irish history, a definitive history and analysis of the riot in Ireland remains to be written. Written by: John_Dorney on 24 March, 2011.on 4 May, 2012. 16 Responses to "Book Review: Riotous Assemblies – Rebels, Riots and Revolts in Ireland"
Good review. Wasn’t there anything about the 60s in the south? There was a lot of social protesting relating to ground rents, housing etc going on at the time. It also saw the introduction of protest tactics imported from France and America, things like fish-ins, squats and so on that involved civil disobedience. The Gardaí were completely unprepared for this so it led to a lot of heavy-handedness and even violence. It’s something that seems to have slipped out of the historical radar. That was among the many things not covered unfortunately. Hanley and Millar’s Lost Revolution has some info on that era though. I haven’t read the book under review. Obviously there are limitations on all such collections. However as John points out we have a fairly rich history of rioting here. Most people wouldn’t be aware that the Irish Army has used tear gas to disperse rioters: in Tralee during 1933 (when Eoin O’Duffy arrived for a Blueshirt rally) and in Dundalk in 1972, when republicans besieged the town’s main Garda station for example. There are numerous examples of riots connected to the Northern conflict between 1968-81. There were anti-communist riots in the 1930s, clashes between republicans and ‘Animal Gangs’ in Dublin, sectarian disturbances in 1935 (in response to violence in Belfast) Poppy Day riots in Dublin and so on….room for another couple of conferences? Sounds like a good idea to me. On the theme of say, “when is a riot a ritual and when is it a real battle?” Or something. Judging from that review, the book’s title is wholely inaccurate. In fact, that review looks better researched than the book, which is a pity. Just to be clear, none of the chapters are badly researched, they’re just not fitted together that well. I don’t think the issue is the quality of the research, rather the selection of articles included. Though as for that, I’ll let John confirm for me! As the author of the former chapter, that on ‘Notorious Anarchists’ during the Emergency, I would like to clarify this assertion. I do not claim that my subject has ‘nothing to do with rioting at all’. Please don’t confuse my work with Stephen Kelly’s – on the Border Campaign – where as much is admitted in the opening sentence. Ok, but there is no description of rioting in the chapter is there? I think your approach to the book is rather narrow. OK, disparate material. But it’s titled ‘Riotous Assemblies: Rebels, Riots and Revolts in Ireland’. There is plenty of revolt and riotous behaviour in my chapter – even involving physical violence, if that’s what you’re after. I wouldn’t take it as a criticism of your chapter in and of itself, which was interesting. But the riot is a particular type of protest – public communal violence. In the chapter concerned the only ‘physical violence is one farmer threatening to ‘sink his teeth into the inspector’s belly’. He didn’t do it however. Respectfully, this, the action of a lone, ‘stupid bovine creature’, is not the same thing as a riot at all. Anyway, that was my opinion, I felt a bit dissatisfied with how the book was put together. As i said in the review, there’s plenty of interesting things in this book but it’s not a history of the riot in Ireland. A slightly misleading commentary on our chapter, I thought. In relation to anti-capitalism in particular, our concern was not to portray it as the most significant, the most oppressed, or the most anything – though we would contend that issues in Rossport have been of rather more concern to the “general public” than the review suggests. Rather it was to ask why this particular movement went from the list of those whose protests are routinely tolerated by police (unlike, say, republican or traveller protest) to the list of those which can be met with a much more aggressive response – and, even more interestingly, why this transition, marked by the attack on Reclaim the Streets in 2002, was not supported by those institutions which normally agree with police definitions of protests as “riots”. Finally, the RTS 2002 event – which marked the public “coming-out” of the newly aggressive Garda response to anti-capitalist protest – can hardly be explained as the product of ex-Genoa activists convinced that revolution was around the corner (the review’s explanation for this transition). The RTS street parties had become regular events by this point. Far from being provoked by participants (as even mainstream media observed at the time), the protestors had already been moved a considerable distance through the city centre before the Dame Street attacks, which targetted tourists, people standing in the taxi queue and a journalist from a mainstream newspaper along with the partygoers. The chapter itself is online at http://eprints.nuim.ie/2474/ for those who would like to get a more accurate sense of its contents.